Experience the beauty of this special Mitzvah in the privacy and intimacy of a tastefully decorated Mikvah. Mikvas Chaya is flawlessly maintained, fully equipped, and beautifully appointed to make your visit a pleasurable one. A mikvah (or mikveh) is a place used for ritual immersions. A proper mikvah contains a minimum of 40 SE'AH (about 87 gallons) of undrawn water (not filled by bucket or by metal pipes). In general, if there are more than 40 SE'AH, then the remainder of the water may come from any source. Natural lakes, whether or not fed by streams or rivers, qualify. However, these waters may be inaccessible or dangerous and have problems of inclement weather and lack of privacy. Jewish life therefore requires the construction of mikvahs and this has been done in every age and circumstance. 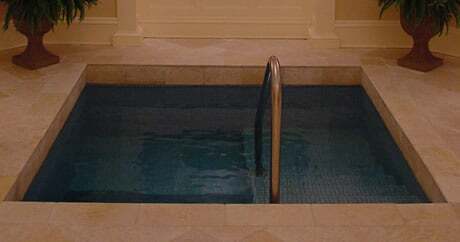 Indoor mikvahs, such as the mikvah at the Chabad Lubavitch Center, may thus be used if they meet stringent halachic standards. Our mikvah is beautiful and aesthetic. It is located at Chabad Jewish Community Center. Mikvas Chaya is a pay per use fee schedule. Standard rate of $25 per visit. Rates may change for special appointments or for after hours. In addition to Mikva fees, Mikvas Chaya relies on donations to cover operating expenses. Please consider making a tax deductible donation to help us continue this important service for the community.